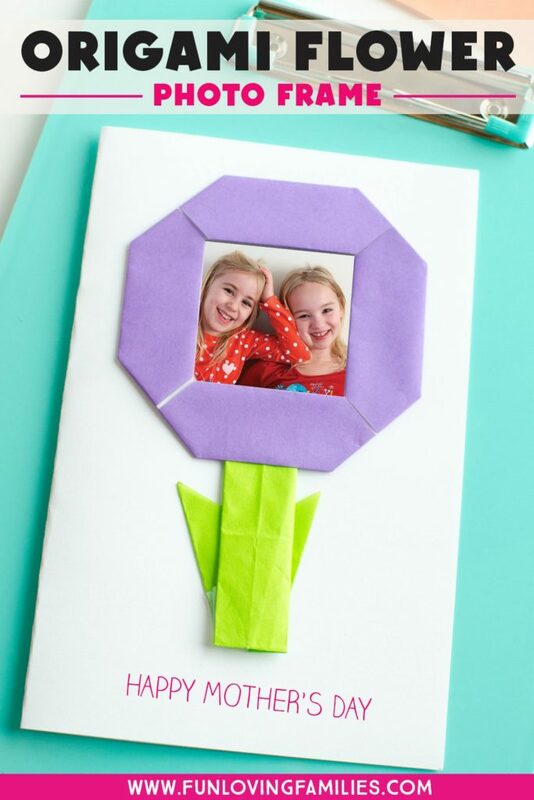 Use this simple origami flower pattern to create a sweet Mother’s Day card she’ll cherish for years. A few months ago, when looking for some new origami projects for my kids, I came across this origami book with a bunch of cute patterns in it. As soon as I saw the flower pattern I knew I wanted to make Mother’s Day cards with it. 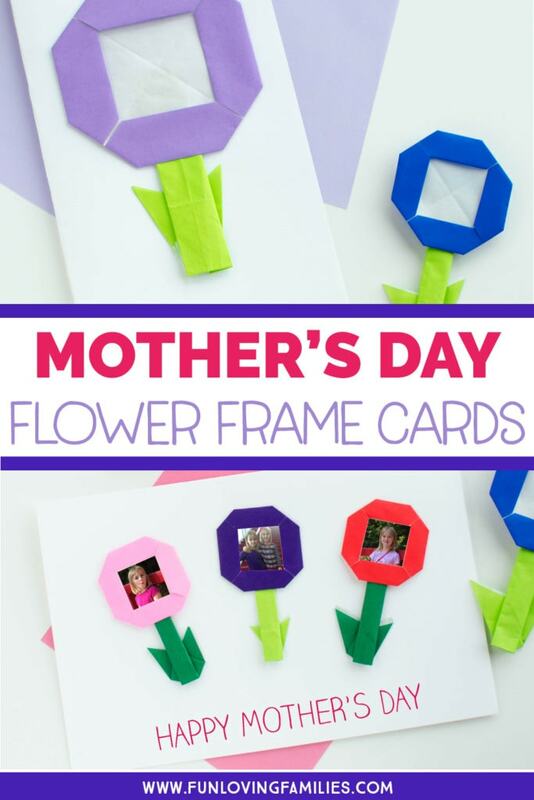 It’s perfect for a Mom or Grandma because the flowers easily lend themselves to being made into little photo frames. The flowers themselves are pretty simple and straightforward. The stems are a little finicky, but after a few you get the hang of it. I made a few for practice, then my 11 year old came over and easily finished the rest of my stems for me. She’s always loved doing origami crafts, and the folding came pretty easy to her. We created a video showing the folds so you can make your own. You can pick up a copy of the book (Hello Origami) from your library, or purchase here, to see the flower pattern and the other cute projects in the book. I used a 6″ square piece of origami paper for the big flower, and 3″ square pieces for the small flowers. *If video doesn’t load, try disabling ad-blockers and refreshing. I also love the idea of taking pictures of the kids holding a signs that read “Happy Mother’s Day” and using those photos in the flower frames. Or a favorite photo of Mom or Grandma with the kids. 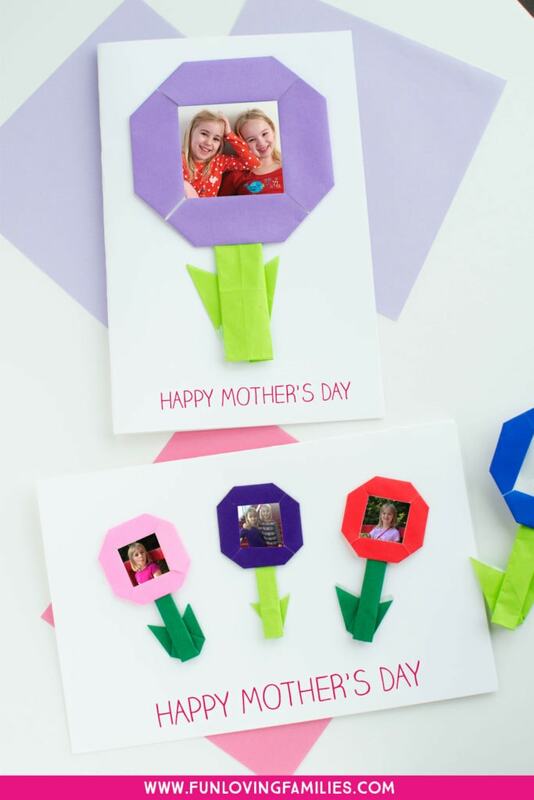 Finish the cards off with special messages from the kids inside the cards and you’ll have a truly special homemade Mother’s Day card from the kids. Have the kids fill out these Mother’s Day questionnaires to include with the homemade cards. Surprise Mom with these sweet flower cookies. Get lots of ideas for homemade gifts you can make for Mom or Grandma. If you enjoyed this post, I’d love it if you’d share it with friends by pinning the image below or sharing on Facebook!